Try to do that in Singapore and it’s a matter of time before you come down with depression. With the increase in employee attrition, recruiters are spending crazy hours going through and filtering the most suitable candidates from thousands of resumes across different platforms. It doesn’t help that we are looking at another quarter of low unemployment rate (1.8%). This has been going on over the past 12 quarters and it should continue to sustain until something crazy happens and hit Singapore in the face. And like it or not, young Singaporeans are going to make up the bulk of the workforce. They are not looking for jobs like the way their parents or grandparents did. Reaching out to them via job boards simply will not work. Just look at the stats. The traffic of JobStreet over the past 6 months has dropped from 2.25mil (dec 2014) to 1.5mil (May 2015). And this isn’t just happening to JobStreet. The stats on JobsCentral is telling us a drop in traffic to their portal too. Even Jobs Bank, with the highest number of job vacancies, only manage to bring in 360,000 visitors in May 2015. This is a 47% drop compared to Dec 2014. And I haven’t even discount away the visits that originate outside of Singapore, which takes up about 30%. Would you fish in a pond that is drying up? So I really hope this piece of stats will knock some sense into recruiters, especially those who works in agency, that continue to double down on their ads foolishly to a shrinking crowd. Compare that to the traffic Facebook is getting from the 3.8 million Singapore users. According to a report by We Are Social, Social media users in Singapore spend 2.2 hours on average per day on all social media channels, slightly above the world average of 2.0 hours. This ranks the country 15th in the world in the list topped by Argentina with 4.3 hours. Even if only 30% of that 3.8 million logs in regularly, you are looking at 1.14 million visits. Per day. Every 2.2 hours. But if everyone starts to fish in Facebook pond, you are going to have another problem too. So you gotta diversify and be really creative to reach out to your target audience. 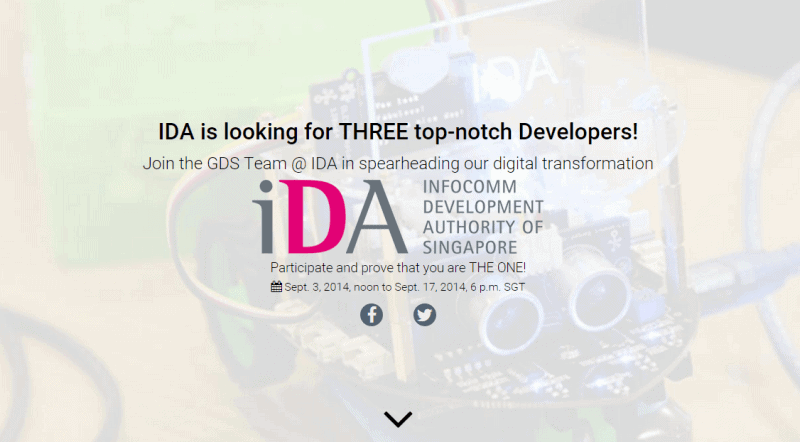 Using HackerTrail platform, IDA held a coding competition that created quite a buzz in the industry. With more than 200 people taking part, it allowed them select the very best. The top 3 winners joined IDA and are working with Government Digital Services to provide solutions to various public agencies. 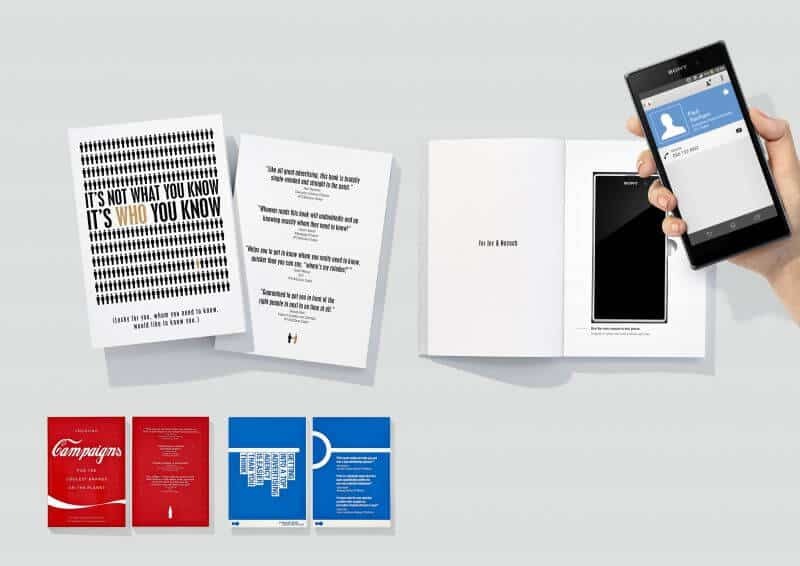 By slipping in a career instruction into every single of their packaging, IKEA tap on a pre-existing channel to reach out to thousands of their customers with an instruction sheet that is so familiar to all of us. 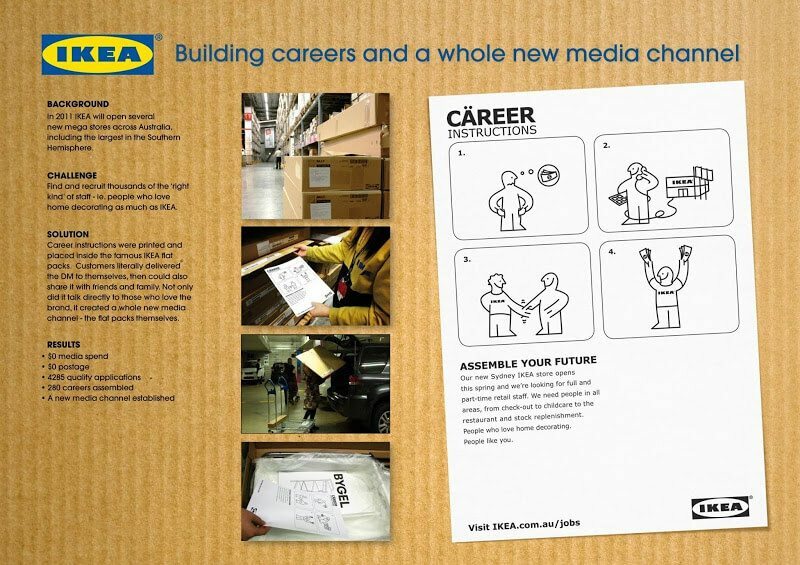 The IKEA Career Instructions campaign brought in 4,285 job applications, which resulted in 280 new hires. Since this unique campaign focused on the customer and targeted people who like IKEA to begin with, the brand didn’t have to go through traditional marketing channels, such as media advertising, and was able to cut hiring costs. When you want the very best, you will go to all length to reach out to them. The project began by drafting a list of Red 5’s dream team, people whose work the studio admired. They custom-engraved with each recipient’s name and a unique code. Each iPod was more than a special gift: it was the key to accessing the Red 5 website, where they could learn more about the company, as well as the job that Red 5 had cherry-picked them for. The response rate was overwhelming. Red 5 had a nearly 100% response rate on their campaign; by comparison, most direct mail initiatives are considered “successful” if they hear back from two percent of their recipients. Furthermore, Red 5 got supremely viral: almost every person used the website to send invitations to their friends, spreading the word even more. In cooperation with the delivery service Croque Master Scholz & Friends created the „Pizza Digitale“. A special pizza, which was for four weeks added to every order from other major agencies’ employees. The recipe was simple: Pizza dough with tasty tomato sauce, shaped like a QR-Code, which directly links to a mobile landing page. That way we made sure our message – Scholz & Friends is seeking for Digital Creatives – would reach just the right person. The Result: Lots of job interviews and some new teams for our Digital Department. Target Audience: All major agencies’ employees, who have enough digital competence to decode the Pizza Digitale. As you can see there are multiple ways to reach out to your target hiring audience. Even if you are not a creative agency, you can easily leverage on your current means of market channels like what IKEA did. Putting job ad on the back of a receipt (for retailers) or even printing requisition on plates (for food court operators) might work and drive better goodwill to the company.